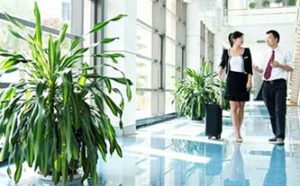 Can Houseplants Make Air Healthier in Office Environs? Sure, houseplants can enliven an indoor environment, but can they actually alter it for the better? According to scientists and other lab coat types, certain ones can. That’s because some houseplants traffic in something called phytoremediation, which acts as a catalyst to remove pollution from either the air or soil. Farmers for years have used phytoremediation techniques to combat contaminants and heavy metals in soils, growing specific plants in polluted soil to leach out the bad stuff. Once the soil is no longer harmful, the farmers then rotate crops back in. This concept also extends into the general population. Researchers at Pennsylvania State University conducted tests to see whether ozone levels could be affected by common houseplants indoors. Given that ozone is a major component of air pollution, the researchers theorized that if houseplants could have a positive effect in reducing ozone levels, they could rid indoor environments—both homes and buildings—of pollution. The researchers pumped measured ozone into a closed environment with common spider plants and snake plants; they also replicated the environment in a chamber without the plants to compare ozone levels. The result: ozone levels significantly decreased in the area with the houseplants. NASA has also conducted tests on houseplants, finding that some were so effective at removing irritants that greenery is being considered as ridealong material in future space missions. Those types of findings have spurred interest in using plants to improve indoor air quality. And, in recent years, forward-minded facilities have employed interior landscaping services that use more than just the typical fake-tree-in-a-huge-pot approach to greening up buildings, opting for real plants that can do real good. Spider Plant—this easy-to-grow plant with arched yellow, white and green leaves quickly produces offshoots that resemble “spiders” hanging from a stem, which then can be trimmed and replanted, creating more plants. As mentioned above, the spider plant has been shown to be extremely effective at removing ozone from the air. A source of ozone in buildings: copy machines. Anthurium—This dramatic and exotic-looking plant features red, heart-shaped flowers and thrives in indirect sunlight (read: almost every corporate environment devoid of ceiling-to-floor spanning windows). The dark leaves process ammonia, the toxic chemical toluene, xylene and formaldehyde. Ficus Tree—this office mainstay grows quickly and can be quite large, and removes benzene and trichloroethylene from the environment. Bamboo Palm—These bushy plants also remove benzene and trichloroethylene from the air, as well as formaldehyde. Of course, a simple way to remove VOCs, allergens and viruses from indoor air doesn’t require a green thumb at all. AeraMax Professional’s line of commercial air purifiers remove up to 99.9% of airborne contaminants from indoor air. And, they’re the only solution proven to capture airborne flu virus. Couple that with certification from the Asthma and Allergy Foundation of America, and AeraMax Professional air purifiers can be a simple solve for indoor air pollution problems.